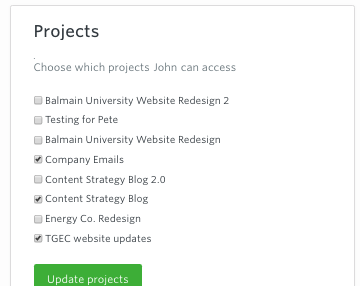 Based on roles and permissions you can manage which user accesses which project. They can also be given access to all projects. Depending on someone’s role; they may automatically be given access to all projects, while others will have to be manually added to projects in order to access them. 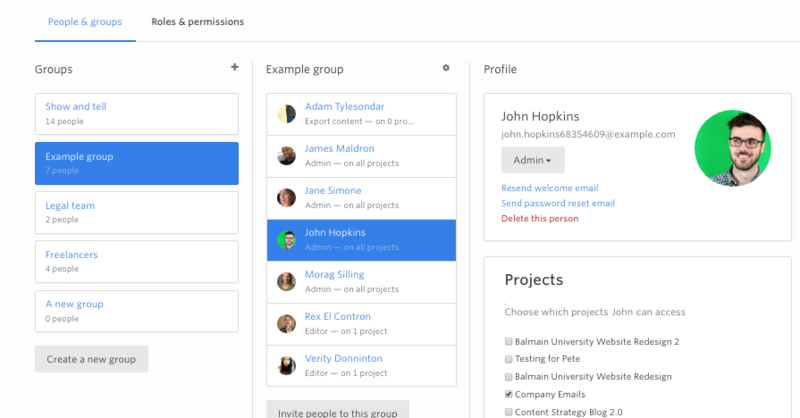 For example: the default role of Admin is automatically given access to all projects, while the default role of Editor has to be manually given access to a project. Depending on a persons permissions, they may have access to all projects by default. You can select ‘Update projects’ to save your changes. This will immediately grant them access to these projects. Tip: You can select multiple people in a group by holding down Ctrl (PC) or Cmd (Mac). You can select everyone in a group by using the drop-down at the top of the list or people. To find out more about what a user can do in a Project, see this help article on Understanding Roles and Permissions.